It's time to binge on Netflix again. That's according to TradingAnalysis.com founder Todd Gordon, who says the streaming giant is about to make a comeback. While the stock has given back gains it made on Tuesday thanks to an upgrade by Guggenheim, Gordon says Netflix's earnings report on Nov. 16 will drive the stock higher. "We've been in a period of underperformance here in Netflix for some time, and I'm thinking that we might now have the catalyst to break this consolidation," Gordon said Wednesday on CNBC's "Trading Nation." 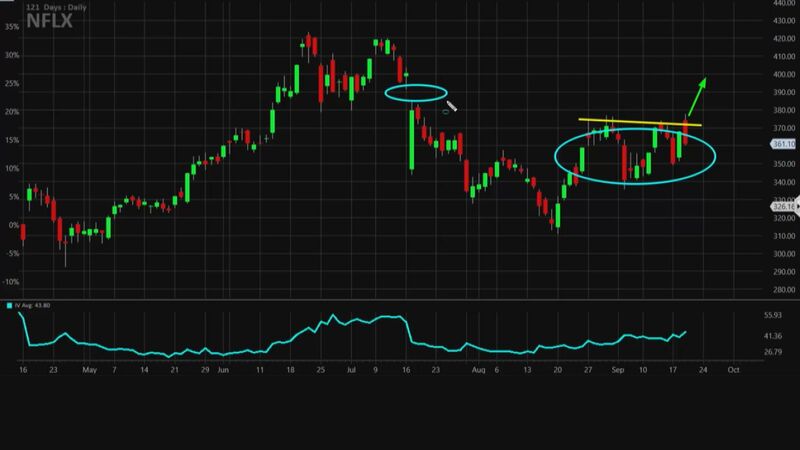 "[I think we will] get through this $375 resistance level, begin to move up and potentially close this gap that exists from around earnings, back at around $390." To play or a nearer-term move up, Gordon suggests selling the October monthly 365-strike put and pairing that with the purchase of the October monthly 360-strike put for a credit of $2.58, or $258 per options spread. Gordon wants to sell a put spread because implied volatility, or the price of options, is on the rise prior to Netflix's earnings. If Netflix were to close above $365 on the Oct. 19 expiration of the options, then Gordon would make the $258 credit on the trade. If Netflix were to close below $360 on the expiration date, then Gordon could lose up to $240. Shares of Netflix closed around $366 on Wednesday, meaning that Gordon is well-positioned in his trade. Shares of Netflix are still up 91 percent year to date.